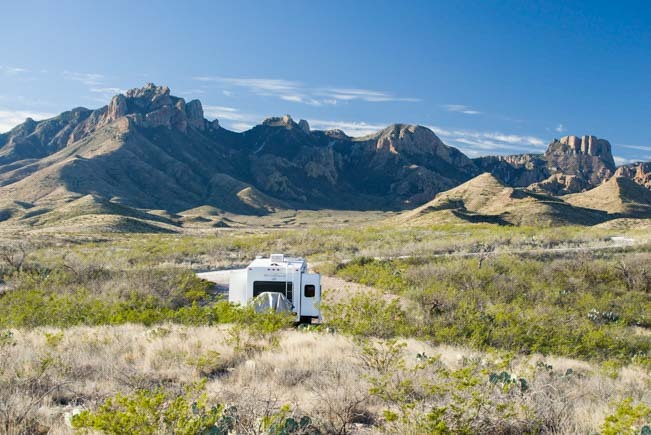 Big Bend in Texas is an unusual park in the National Park System because they offer a few inexpensive RV dry camping sites scattered about the park grounds. It isn’t really “boondocking” like you’d find on other government public land managed by the US National Forest Service and the Bureau of Land Management. However, it is a very inexpensive and scenic alternative to staying in a conventional RV park or campground. For first-time boondockers, it can offer a great introduction to dry camping amid nature and solitude in your RV. Big Bend National Park assigns these campsites on a first-come first-serve basis, as if the entire National Park were one huge campground. 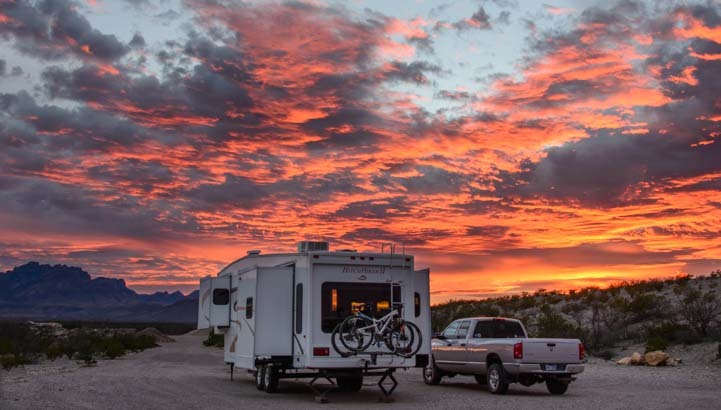 The sites that are big enough for large RVs are very few and are tightly controlled, and the system for obtaining a “Backcountry Camping Permit” to stay in one can be confusing. Here is what we learned about the system when we took part in it for two weeks during February and March, 2015. All five of the Visitors Centers in the park have computer access to a database of dispersed campsites throughout the park. You can obtain a permit and reserve a site in person from a ranger at one of these Visitors Centers 24 hours ahead of your stay. The permit is $10 and you can reserve up to 14 consecutive nights in specific campsites on a single permit, reserving as many different sites as you like and as are available. An important point is that the permit is good only for the actual nights and sites you reserve through the ranger when you purchase the permit. If you want to extend your stay or change your campsite after you buy your permit, you have to cancel the remaining nights on your permit and buy a new one. Also, you can’t obtain a permit to reserve a site without appearing at a Visitors Center in person. As a courtesy to other campers: if you don’t use all the nights on your permit (the weather might turn and send you scurrying, as it did to us), be sure to cancel the remaining nights on your permit by stopping in at the Visitors Center or calling them. Otherwise, the site will sit vacant while other RVers are wishing they could use it. Many RVers have small driveable rigs and there is no evidence they are using a site during the day while they are out hiking, so unless you tell the Park Service you are vacating your site, they will have no way of knowing that you left early. From what we observed, there is one computer at each Visitors Center that has access to the backcountry camping permit database, so a line for permits forms during popular times. We stood in line at the Panther Junction Visitors Center in the middle of the park for 30 minutes on a Saturday morning when the weather for the next few days was predicted to be sunny and in the high 70’s. The other people in line were primarily backpackers and car/tent campers getting permits either to do extended overnight hikes across the park or to camp in remote dispersed campsites we could never reach with our truck and trailer. We were the only RVers in line waiting for a site big enough for a big rig. Each person spent about 5 minutes with the ranger, first reviewing the map of the National Park to pick out a campsite and to learn from the ranger what the site was like, and then filling out the permit application, and lastly listening to the ranger read the camping rules aloud. When our turn came, we were advised against staying in a particular site that we later found out would have been perfectly fine. However, an RVer had complained at one time that the site was unlevel, so this particular ranger decided not to present that site as a viable option to other RVers with big rigs. It is wise to study the National Park map (click here and go to “View Park Map” — the campsites are the light colored tents) and even to drive to the various dispersed campsites to assess whether or not your rig will fit and whether you might enjoy camping there. In general, rigs under 30-35 feet in total length end-to-end (hitched up) would fit in most sites along the main roads. One of the rules that appears to be enforced is that you are not allowed to run a generator in backcountry camping sites. We overheard two rangers discussing a tent camper who had hidden a generator in his tent! If you don’t have solar power installed on your RV, a small portable solar power kit may be the way to go. It is common to find that all the campsites are booked for the first few days after you arrive. So, plan to stay elsewhere at first and keep checking back until a site opens up. The campground at Rio Grande Village on the far eastern end of the park has both full hookup sites that can be reserved online and dry camping sites that are first-come first-serve. Rates range from $33 for full hookups to $14 for dry camping to half that for Seniors with the Senior Access Pass. The other two campgrounds inside Big Bend National Park — Cottonwood, towards the southwest near the Santa Elena Canyon hike, and Chisos Campground, up in the mountains near the Lost Mine and Window Trail hikes (review of those hikes here) — have smaller sites that may not accommodate bigger rigs. However the Big Bend Resort & Adventures RV Park in Terlingua-Study Butte just outside the western boundary of the park offers full hookups and advanced reservations. 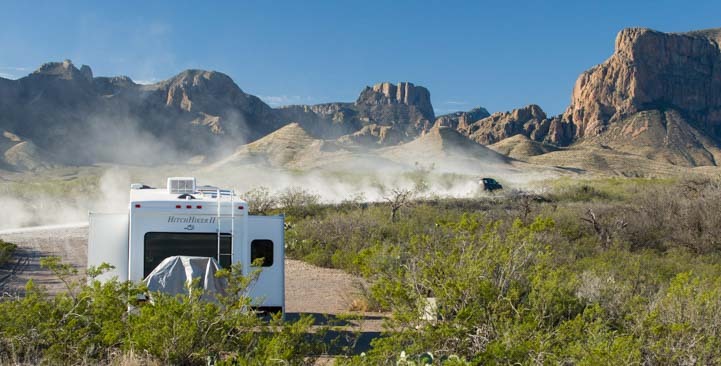 Each of the “boondocking” campsites we saw in Big Bend has pros and cons. One strategy for tackling Big Bend National Park with an RV is to spend a few days camped on the western side at Big Bend RV Adventures, a few days of “boondocking” in the dispersed campsites in the middle and a few days in Rio Grande Village at the eastern end of the park, as there are outstanding things to see and do in each of these locales. Camping near your planned activiites will cut way down on the commuter driving you do across the park! For those with more rugged rigs, there are some fabulous sounding campsites that will get you deep into nature. We didn’t camp at or even see these locations, but friends with an Earth Roamer RV enjoyed some true backcountry camping experiences in their rig. There are three campsites on this dirt road that goes 6 miles out to the Grapevine Hills hike with the balancing rock. The first is 0.3 miles in on the left side and is suitable for a big rig. This particular site is also known as “Government Spring” and can accommodate a big rig and a smaller one comfortably if friends are traveling together. Campsites two and three are 3.7 miles down the road on the right hand side and they are essentially a double site. The views of the Chisos Mountains are lovely, however this is a very busy road with lots of people flying by at wild speeds to get to and from the hiking trail at the end, so it can be very dusty. There are three campsites on the first part of this dirt road. The first at 0.9 miles would be suitable for a rig of 35′ or less end-to-end. The second and third are 2.1 miles in and are good for a trailer of 25′ or so. We weren’t sure we could have squeezed our 36′ fiver in there. See the comment from Robin below who had a great time there with a 24′ travel trailer. There are two campsites in a huge open area at the end of this dirt road down about 0.5 miles. Probably 3 or 4 big RVs could fit if friends were traveling together. This is the site that one RVer apparently felt was too unlevel for a big rig, but when we drove down here we thought it would have been an awesome place to stay and just wished the ranger had mentioned it as an option. This is a very rough dirt road that has a small site for a small trailer, van or truck camper at 1.1 miles. Further on, at 1.5 miles, there is a little more room, but it would take some jockeying for a big rig to get set up. See the comment below from Robin who said they loved the second site and got their 24′ travel trailer into it just fin! This is a highway maintenance yard about 0.1 miles down a dirt road that has a huge site big enough for several RVs and even has a horse corral. The entrance is quite steep and we used 4×4 Low Gear to climb out. The enormous trash heaps are a little off-putting as you drive in (“Are we going camping in a junkyard?” we asked each other! ), but there is a berm on the west side that provides wind protection (if it’s from the west), and the mountain view is beautiful. Dust can be a problem at some sights (this is Grapevine Hills). The busy seasons at Big Bend National Park are Thanksgiving, Christmas and Spring Break in March. There are RV dump stations at Big Bend Adventures RV Park outside the western boundary of the park and at Rio Grande Village at the eastern end of the park. Cell phone and cellular based internet access is acceptable at the boondocking sites with a WiFi booster and antenna. WiFi is sometimes available at Rio Grande Village, however when we were there we heard it had been turned off because someone had been abusing the priviledge. This entry was posted in The Full-time RVing & Cruising Lifestyles and tagged Big Bend, Great RV Campgrounds, National Parks US, New, Non-Travel, Texas by Roads Less Traveled. Bookmark the permalink. Thank you so much for this guide! We’re hoping to visit Big Bend next winter, and up until now I’ve been confused by how it all works. Sounds like we should plan to spend a few days in the campground while we try to obtain a boondocking permit. Thanks again, and I can’t wait to see this beautiful park in person. I hope it helps, Amanda. We were confused beforehand too, and when we got there, even as we (very slowly) figured it out, we knew lots of others were confused too! Who knows, the Park Service might change the process all around, but hopefully this gives an idea of what to expect for now!! Enjoy it when you get there!! Hi! Great information about Big Bend. We boondocked there this year March 2 – 16 with a 24 foot travel trailer. We stayed at Paint Gap 3, Grapevine 3 and, K Bar 2. We really liked Paint Gap and K Bar because of their privacy. In addition there is a nicely marked trail from the K Bar 2 site. We didn’t have any issues getting our 24′ trailer into or out of any of these sites. Great information!! Thanks so much for sharing. Thank you for sharing you information. Two years form now, I’ll be doing a 5,000 mile “western” circuit of 5 states, then a 20,000 circuit of the periphery of America. As my email suggests: I am a writer and artist, so I know I will have many delightful months. Your sharing makes every site I find easier.